Loosely centered around The Sixth Street Community Synagogue in the East Village and avant-garde label Tzadik Records, a community of Jewish artists, including Jake Marmer, Basya Schechter and Rabbi Greg Wall, is lifting up and re-forming those dismantled words. Their endeavor is an ancient one. My Fragments of Your truth, O my God. "The more complex the music is, the higher the words can go," says Rabbi Greg Wall, a saxophone sage who lists among his many projects an album of Rav Kook's poetry soaring atop cosmic jazz. Over the years at his shul, the Sixth Street Synagogue, Rabbi Wall has hosted a line up of Jewish-music all-stars, most tending toward complexity and expansiveness. Throughout the month of June, some of these artists have graced Sixth Street's stage for the Tzadik Radical Jewish Culture Festival. And on June 29, the festival ends with the public debut of Basya Schechter's poetry-and-music project, "Songs of Wonder," to be released on Tzadik in the fall. But why does Rav Kook call the Jewish people a song? Envision Jacob: his neck pressed on rock, his eyes closed, angels streaming to and from God above. It's a vision without sound. But later, Jacob wakes up. He doesn't just imagine the angels; he wrestles with one. And at the end of this struggle, after the angel is exhausted, Jacob receives a new name: Yisrael -- Israel. In Hebrew, the name means, "struggles with God." But Rav Kook rearranges the letters: Yisrael becomes Shir El, the "Song of God." So too, today, the people of Jacob, the people of Israel, are a song. The memory of Jacob's dream, the dream of Israel's memory -- Jake Marmer hears it and it all blends together: recollection into projection, stranger into native, dreamer into struggler, words into music. It all blends into one endless "Dreamemory," the name of one piece of Marmer's cycle of performance poems called "Jazz Talmud." The idea is simple, but the results -- music that sounds the way a page of Talmud looks -- are rambunctious: Take one Jewish tradition of legal discourse and mix with one part Ukrainian roots, two or more parts American immigrant imagination and 18 parts sonic shtetl goodness; bring to a methodic boil; let simmer for a few thousand years while the commentary collects and coats the edges of the pot. Eventually, when the stew has simmered long enough, when the dream has been thoroughly dreamt, it's time to taste. into the eye of history. 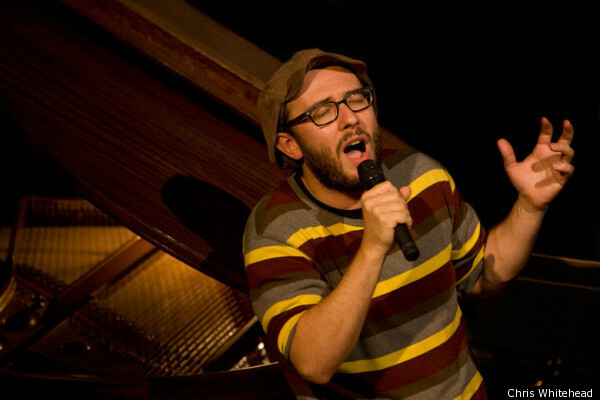 At the end of September 2010, Marmer debuted his Jazz Talmud at the Cell Theater in Manhattan. He was backed by the Ayn Sof Arkestra & Bigger Band, which is led by Rabbi Wall and Frank London, both mainstays of the Jewish jazz scene. Marmer's verses provided the launch pad for the orchestra's Talmudic commentary: Marmer is the Mishnah; London and Wall (on trumpet and sax, respectively) act as the main commentators, Rashi and Tosafot; and the big band fills in the empty spaces with the discussion of the ages. "Poetry is my spiritual practice," Marmer says. "The truest." As a poetry columnist for The Jewish Daily Forward and a Dorot Fellow who spent time in Israel performing his unique brand of spoken word, Marmer is truly a Hasid of Text. But that doesn't limit him. A poem may at some point be written down, but the moment it leaves the poet's lips, it grows wings and takes flight. 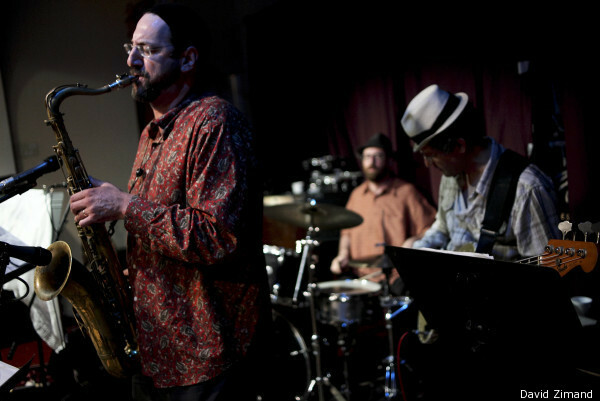 The Jazz Talmud premier in September stuck to the script, but in December, at Sixth Street and Tzadik Records' Radical Jewish Musical Festival on Christmas night, it wasn't hard to hear Marmer stray from the text, respond to the sax-and-trumpet commentary and dismantle some words in the process. But to send those words soaring, he had a bit of help. "It's hard to institutionalize spirituality," Rabbi Wall says. Though he may eschew institutional Judaism, his shul has become an institution for innovative Jewish culture in New York City. There is music at the synagogue on a daily basis. Learning precedes most concerts. Others are hybrids of performance and lesson. Rabbi Wall, too, is a hybrid. He's the rabbi, but he's also an artist. Many of the performances at Sixth Street find him on stage with sax in hand. The music came first. And in some roundabout way, music is what brought him to Jewish practice. "It transformed me," the rabbi says about his early encounters with group playing. "I was tapping into something greater than me." He felt access there to something supernatural and he wondered why. Music, and specifically improvisational music, became an access point to the spiritual. He found the hidden, infinite hallway, and it seems fair to say that he's still exploring its treasures. "Sometimes it's hard to know where the door is to get inside," he says. That's why Sixth Street will soon offer a kollel (an intensive community learning program) for musicians who want to find out how to access their crafts from a Jewish place. It shouldn't be hard. If the whole idea of the Jewish people is founded on a dream, then the revelation of that idea is a result of sound. One can see Jacob asleep on the stone with angels flowing from his head, but one can't hear this scene because it is only an idea in the divine mind. At Mount Sinai, "sight and sound came together," Rabbi Wall wrote in the November issue of Sh'ma: A Journal of Jewish Responsibility. The dream of Jacob and the song of God became reality, when, at the foot of a mountain, multitudes of people "saw what is heard, and heard what is seen." At the point of revelation of Godliness in the physical world, the usual function of the senses became meaningless. But before and after revelation, there is only sound: "Sound," he wrote, "predates any other physical or spiritual manifestation of the divine." God created the world with sound, and it is the sound of creation -- of revelation -- that we hear to this day. On June 29, as the final performance of the Tzadik Radical Jewish Culture Festival, another N.Y. Jew, Basya Schechter, will unveil a project of song and verse that echoes this sound. 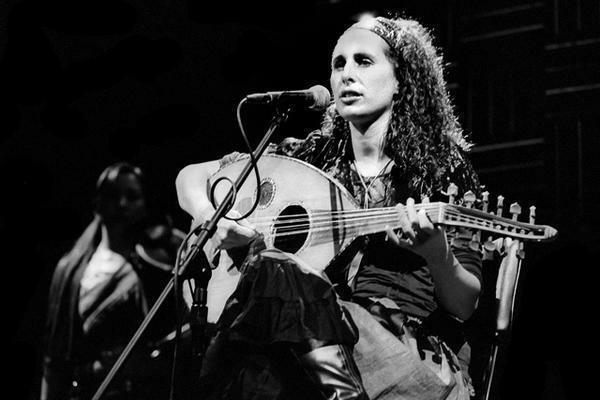 On "Songs of Wonder," Basya Schechter, the artist otherwise known as Pharaoh's Daughter for her multi-ethnic Middle Eastern musical project of the same name, melds the mystical Yiddish poetry of another 20th-century great, Abraham Joshua Heschel, to music. Heschel wrote the poems in a time of transition. He was leaving the Hasidic world of his motherland Poland just as the Nazis were wreaking havoc, but he was not yet the influential multi-denominational American Jewish leader he would become. Schechter also grew up in the Hasidic world and now inspires Jews across the spectrum of observance. So the project, which is based on a book of Heschel's poems called "The Ineffable Name of God: Man," fits. For "Songs of Wonder," Schechter did not compose music. Rather, reading the Yiddish verse late at night, over and over, she started to hear the cadence of the words. At this point, though the music still had not emerged, she says she felt, "OK. This poem, I can wrap my mouth around it." Repeating the lines again and again, she could finally sense a rhythmic pulse. After that, the music composed itself. For Schechter, whose habit it is to craft melodies, riffs and trances to create a framework and then fill in the spaces with words, that the words themselves created the song speaks to the secret of language. It's as if the soul of each letter in each word were singing its song. Schechter says there's a boundary that must be crossed with a given text -- from outside poem to inside poem -- before it can sing its song. Read enough times, the verse becomes like breath, and the words flow within. After that, the music just emerges, and thus the words ascend. Because the music came from reading Heschel's poems in Yiddish, the "Songs of Wonder" remain in the original: "The language that they're written in has a certain cadence and integrity that gets lost when they're translated," she says. trading, twining my pain with yours. Am I not you? Are you not I? My nerves are clustered with Yours. Your dreams have met with mine. Are we not one in the bodies of millions? as if under millions of masks My face would like hidden. I live in Me and in you. from your eyes drips a tear its source in Me. When a need pains You, alarm me! You live in Yourself, You live in me. From the documentary "Praying With My Legs," (c) 2010 Ways & Means Productions from Steve Brand. Editor's note: This is the third in a series of posts chronicling Jewish mystical musical experiences and encounters. Read the first post on transcendent song and the second on the Jewish connection to Phish.